an exciting time for me. So, be sure to check out all of them. and am so inspired by such original, beautiful ideas. Atta Girl Says is the handmade goodness after me. See all 25 on the tour. 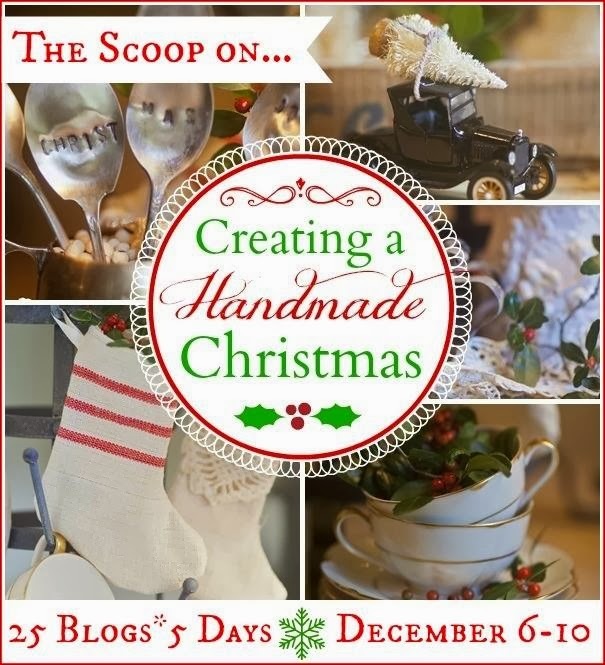 something special for your Christmas. doll-like angels, and angel wings. I decided to create some of my own design. This wild-haired beauty is the result. written directions are trying to describe. TIP: Print the numbered directions and photos. The fun is in creating an angel somewhat like the one I created. 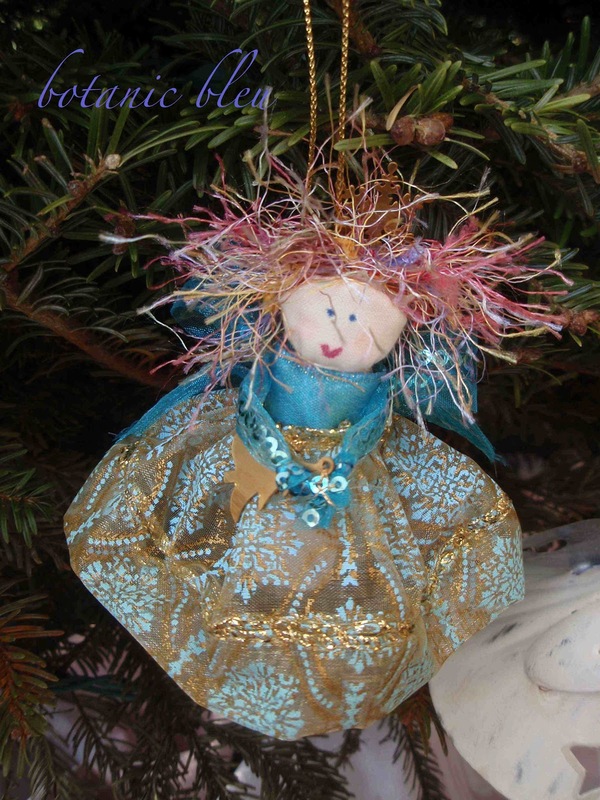 create your very own unique angel ornament. Cut a rectangular piece of muslin for the entire body and head to the size you want your ornament. I cut my muslin about 4"x 2.5", making my ornament about 3.5" tall x 1.25" wide. Sew (using a 1/8"-1/4" seam) the rectangular muslin together, and position the long seam in the middle of the back of the angel. You now have a rectangular piece of muslin open at both ends that will be the angel. 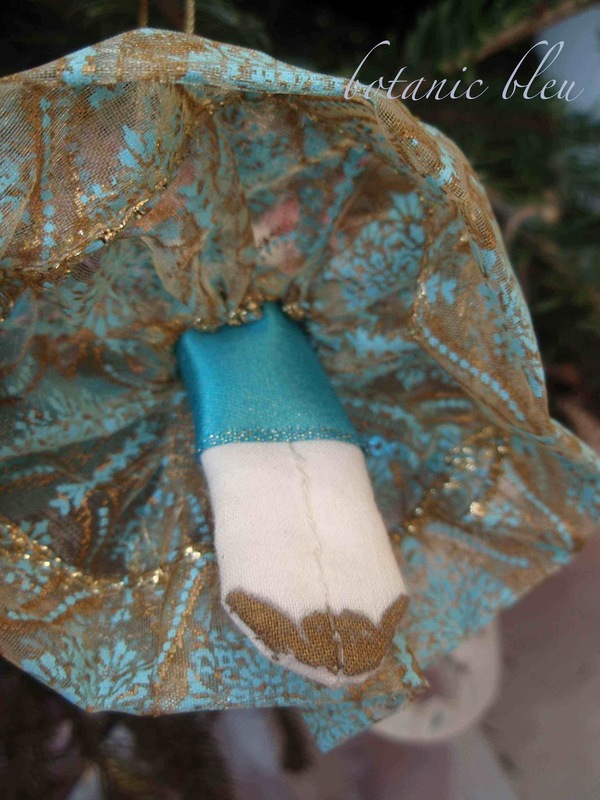 To create the feet, sew one end of the angel by sewing at a diagonal from each side to the mid-seam. Still leave the other end open for now. Turn the fabric right side out (seams side in). Fill the muslin with the cotton ball, stretching the cotton so it lies flat and fills the entire angel body/head. Sew the open end of the fabric together so that the top of the angel's head is slightly rounded. I did this by hand, not the sewing machine. Use a double thread to wrap around the cotton-filled rectangle 2-3 times to create a neck and head. Tie the thread to secure it. Make the head about 1/5 the length of the rectangular cotton-filled muslin. Sew a seam through the cotton-filled muslin, beginning at the middle of the feet at the bottom and stopping about 1/3 the length from the bottom of the angel. This creates the legs. Measure around the angel to determine how long a piece of ribbon to cut for the angel's bodice (solid teal ribbon in my angel) that will seen above the angel's skirt and extend below the skirt. Add about 1/8"-1/4" to angel's circumference to allow for overlapping the ribbon. 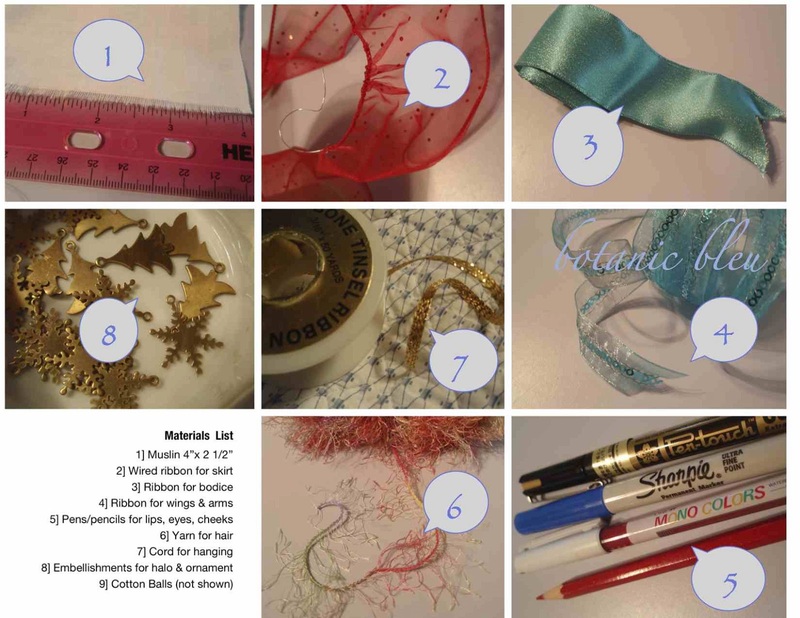 Wrap the bodice ribbon around the angel, positioning the top of the bodice just at the neck you created. Use fabric glue or Mod Podge to attach the bodice ribbon to the angel instead of sewing a seam. I used fabric glue. Use wired ribbon (teal and gold patterned in my angel, but did not have anymore for the materials needed photo) for the skirt. Cut a length of ribbon about 2 1/2 times the circumference of the angel so that the skirt is full. Pull the wire on one side of the ribbon to create the gathers and wrap around the angel's waist, pulling the wire until the ribbon just meets at the back of the angel. See the MATERIALS LIST photo #2 that illustrates gathering the ribbon. Turn each end of the wired ribbon under so that there is no raw seam showing. 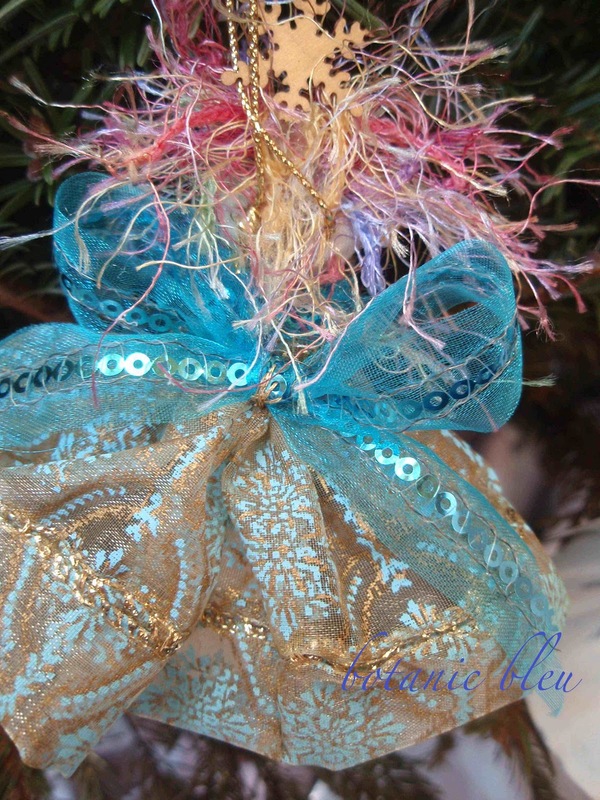 By hand, stitch the wired ribbon at the back of the angel to secure it to the angel's waist. You may need to put a stitch underneath where each arm goes to hold the skirt in place at the waist. Stitch the two ends of the angel's skirt together by hand. If the ribbon's width hangs below the angel's feet, hem the bottom of the skirt (I had to turn my ribbon up...see the photo). Sew one stitch in 4-5 places to keep the hem turned up in place. Cut two lengths of ribbon/cord/thread for the angel's arms. I used the same sequined ribbon for the arms and the wings. I was able to fold the ribbon repeatedly until I had the size needed for the arms. Sew each arm to the top of the bodice ribbon. Then stitch the two arms together where the angel's hands would be. Sew an embellishment (I used a gold colored Christmas tree) to the angel's hands. Make a bow from ribbon for the wings. Stitch the bow above the waist through the bodice ribbon attaching the wings to the muslin where the knot of the bow is located. Now comes the fun! Create the angel's hair by gluing (I used Mod Podge) yarn to the top and back of the head. The yarn I used has multi-colored threads going wildly in all directions. 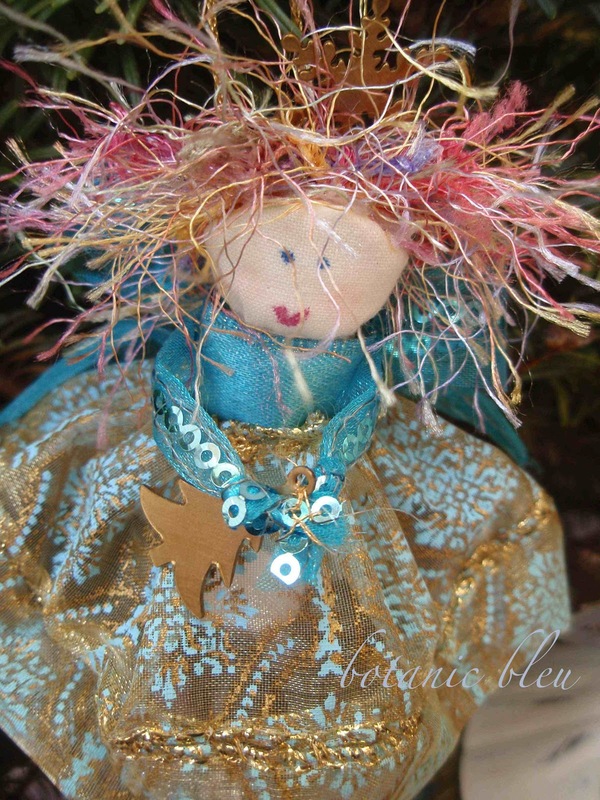 Use Mod Podge to attach an embellishment (I used a gold colored metal snowflake) as a halo on the angel's head. 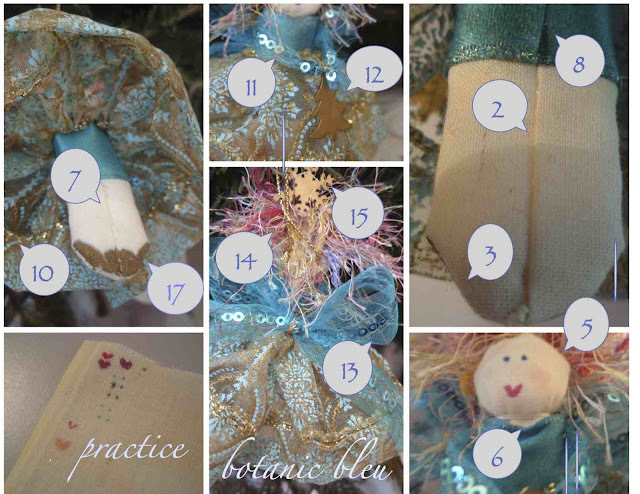 Sew a hanging loop on the back of the angel's head. Use a gold paint pen to paint shoes on the bottom of the angel's legs. I only painted the shoes on one side, the front. The wild hair is my favorite part of this angel! 18. Create the angel's face. Use a pen (I used a blue sharpie) to paint eyes. Use a pen (I used a rosy-colored gel pen) to paint lips. Use a colored pencil (I used a red-colored grading pencil) to create lightly rosy cheeks. before I painted the face and shoes. I tried several red pens/pencils before choosing the ones I used. Here she is hanging with another angel that someone gave me several years ago. Perhaps the angel on the left will be inspiration for another angel project on another day??? Make the bodies of the angels in advance. 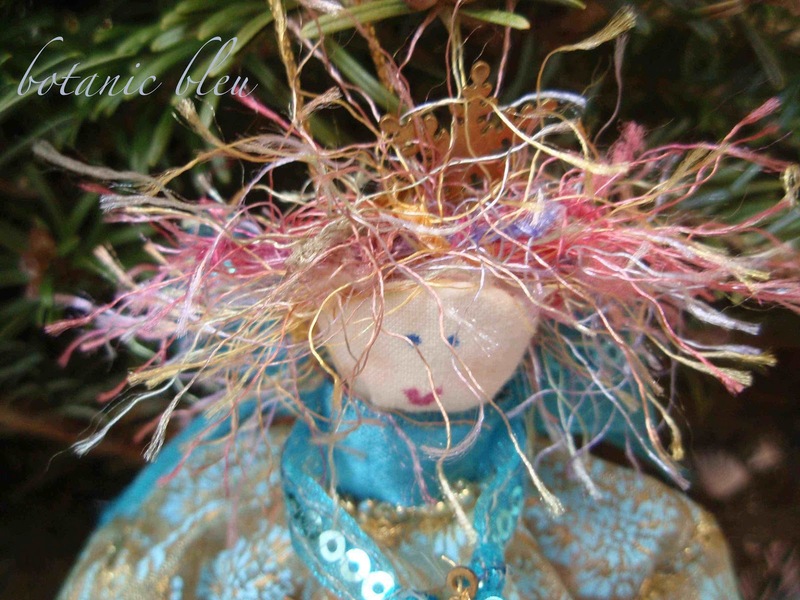 hair, embellishments, painted shoes, and painted faces. try to answer your questions. This is so sweet! I love making projects like this ... thanks for the tutorial. I want to have a creative space in a little spot just like the photo in your header - beautiful. This is a very, very good tutorial. I love your angel and although you could have picked any number of your quality handmade accents to guide us through, I'm glad you chose to share this in particular. Your blog reflects your refined sense of style which is an obvious combination of your homegrown goodness and your world travels. Blessings on your day! What a sweet Angel ornament! Adorable! Love her! Angel ornaments are my favorite! 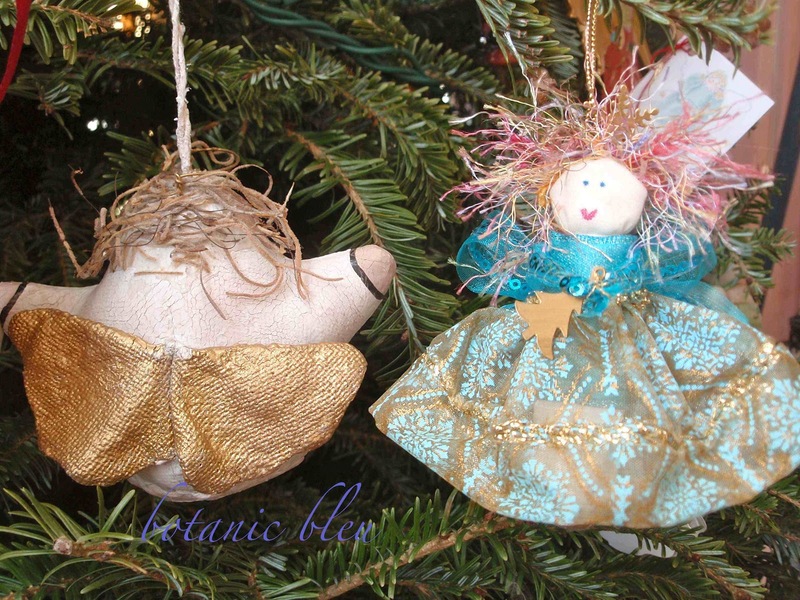 For years I made a different angel ornament every year. this year I pre-made 110 angel ornaments. My 2 and 3 year old kids at church will complete them to take home for their trees. I plan to make some yet, but with a couple of changes to make them a bit more sophisticated.